I’ve been eating limes and tomatoes all summer long: guacamole, caprese salad, ceviche, bolognese sauce, margaritas, you name it. But I just learned something new: these two foods are acidic (that I knew) but did you know that the acids in them and other foods can weaken and erode tooth enamel? Which is a concern since, well, we only get one set of adult teeth. And maintaining a strong enamel is very important because if you allow it to weaken, the entire tooth is more susceptible to decay. The good news is that you (and I!) can keep on eating these delicious foods (I refuse to give up guac, who’s with me on that?!) and minimize the wear on your enamel by using a toothpaste that includes baking soda, such as Arm & Hammer Baking Soda Toothpaste. This toothpaste differs from other toothpastes because the inclusion of the natural ingredient of baking soda neutralizes the plaque acids that can weaken tooth enamel and cause teeth to lose minerals. The baking soda and fluoride in A&H toothpaste actually helps to restore the minerals in your teeth, so in the long-term your teeth and gums are stronger and healthier. And yes, other regular toothpastes will also help keep your teeth strong and healthy but not only do they lack in having the benefit of neutralizing baking soda, research findings show that Arm & Hammer toothpastes is better at removing more plaque in hard-to-reach areas around the tooth and gums compared to non-baking soda varieties. Another nice feature about the baking soda in A&H toothpastes? It gently but effectively removes bacterial plaque, which can stain; hello brighter, whiter teeth! I know I’ve used baking soda and water to gently cleanse items from my kitchen (like coffee-stained mugs) so it works in a similar way brightening your teeth for a fresh smile. 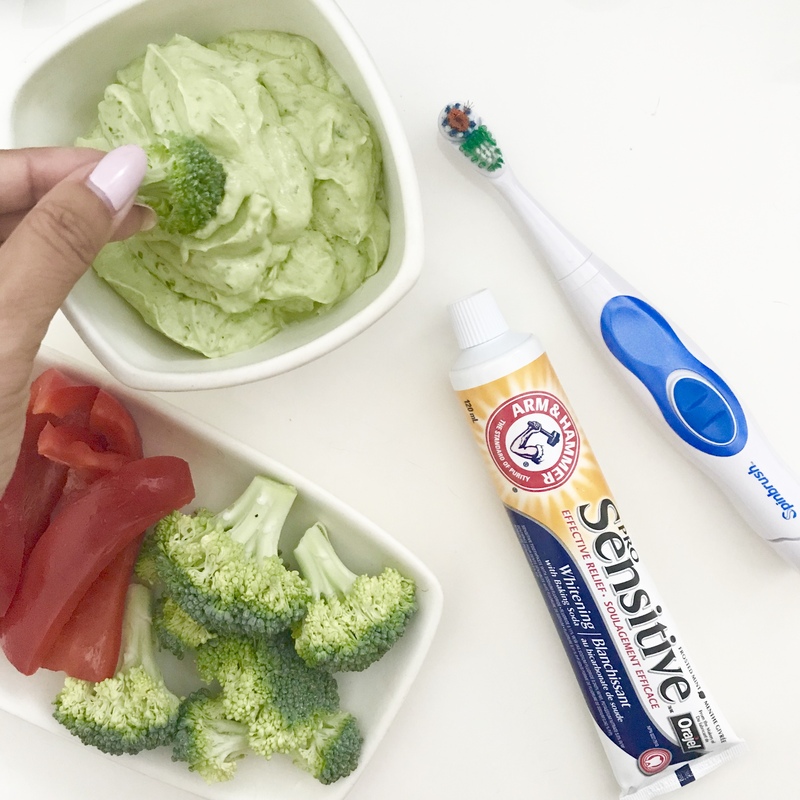 So I’m definitely continuing to eat my fave foods, and have a new fave recipe from nutritionist Keri Glassman that’ll put that baking soda in A&H toothpaste to work: Cilantro Lime Avocado Yogurt Dip. It’s light and refreshing and loaded with antioxidants and vitamin C. Here’s the recipe because sharing is caring. Enjoy! Add all ingredients in a blender or food processor. It seems I have a habit of putting “too much” into my schedule. Notice the quotation marks? That’s because most of the time, to me, my schedule seems just right and not too much…but I have everyone else telling me I’m crazy. Once in a while I might feel frazzled by an overwhelming number of to-dos and that’s when I start cancelling things in my calendar, but for the most part, I guess being busy is my preferred M.O. And I bet it’s yours, too. We are all busy. And that means needing to be efficient with our time, and when something takes more time out of my schedule, well, that can be a deal breaker when it comes to adding whatever it is to my life. Case in point: when I heard that Crest’s new Pro Health HD calls for a two-step brushing process, I thought nuh-uh, ain’t gonna happen. Well, what happened next is I became a Crest Pro-Health HD convert. This is saying a lot because my getting-ready routine I’ve whittled down to 30 minutes since I’m always rushing to get out the door, or at bedtime, I’m just tired and eager to get to bed ASAP. So to add a second step to brushing my teeth, I have to really think it’s worth it. What convinced me to try the product is that it takes care of health and, well, vanity when it comes to teeth. Crest Pro-Health HD helps to reverse gingivitis and get rid of plaque, while also polishing and whitening teeth (and don’t we all want those movie-star smiles?) How it works: the two-step system breaks up key ingredients into separate tubes, allowing them to work their best and perform at their peak. 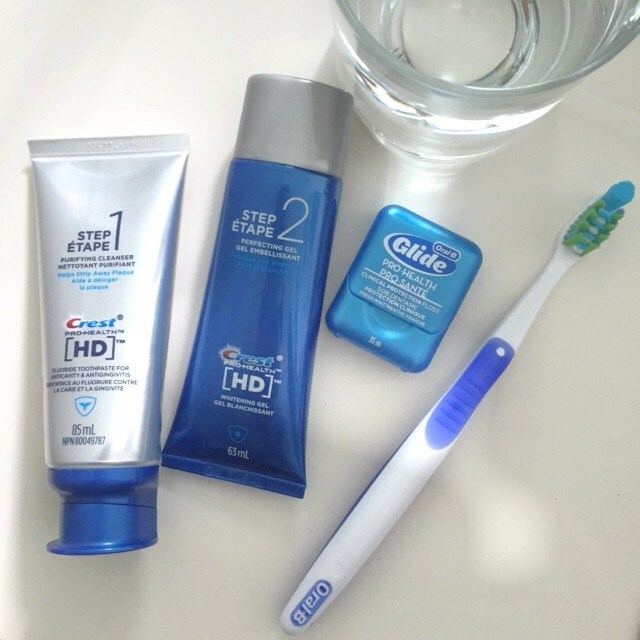 Step 1 is a purifying cleanser that includes stannous flouride; you brush your teeth with Step 1 for one minute. Then you spit–but don’t rinse–and then brush your teeth with Step 2 for one minute. This step is the perfecting gel (for whitening and polishing). 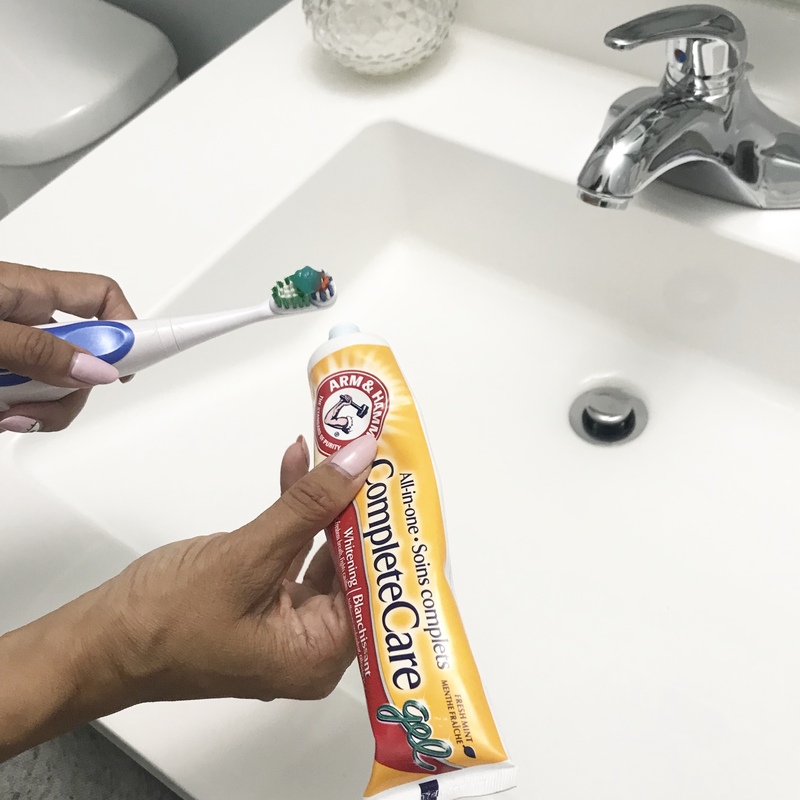 This second step also leaves your mouth feeling really fresh and clean, like how it does when you’ve just left the dentist’s office – you can actually feel a difference after the first use! 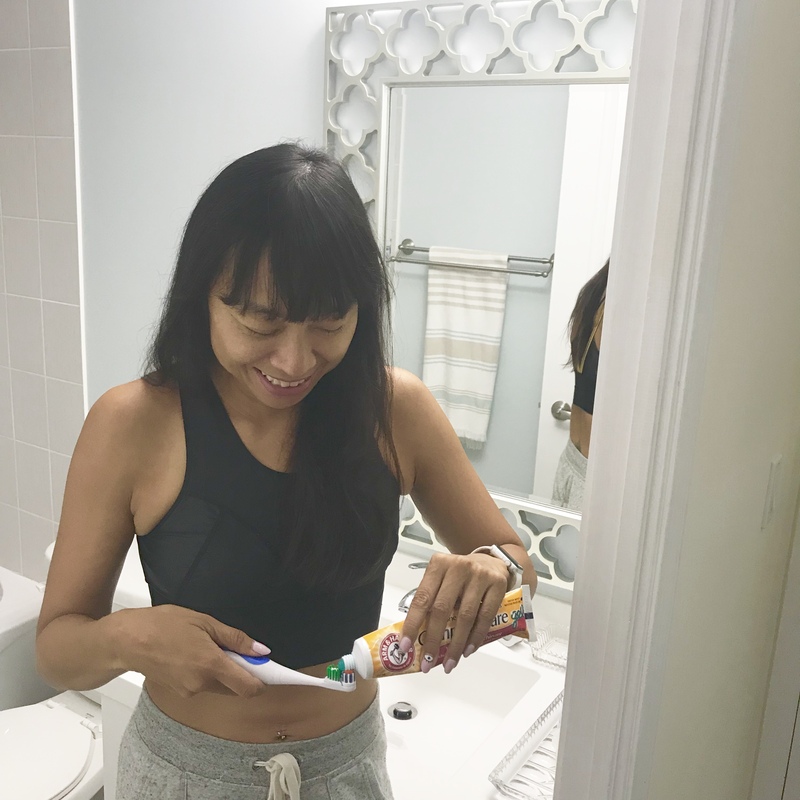 I’ve only been using the product for about a week and it’s really the super minty fresh clean feeling that’s won me over and earned Crest Pro-Health HD its spot on my bathroom counter. I am monitoring the whiteness status of my teeth to see if my pearly whites are getting whiter. Having a whitening agent in my toothpaste is ideal, because I am not so great at maintaining a regular schedule for using whitening strips. Crest is touting it as the company’s biggest breakthrough in toothpaste since fluoride, so that means it’s a pretty big deal. What’re your thoughts on this new innovation? I’d love to hear from you if you’ve tried it out! 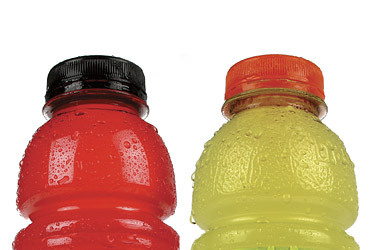 Sports and energy drinks damage your teeth (especially for teens who are drinking these more frequently than ever), and it’s damage that can’t be repaired. These beverages are high in acidity, which can wear down enamel. Energy drinks in particular are bad for your chompers (causing twice as much damage). The study authors suggest rinsing the mouth with water or chewing sugar-free gum after drinking these bevvies — this will get your saliva flowing and that’ll level out your mouth’s acid levels. You might be tempted to brush your teeth right after, but this is not advised — brushing will help the enamel-eroding acid by spreading all over the surfaces of your teeth; wait an hour and then brush if you wish.